Imagine you got yourself a private GitLab instance and your own NPM registry. Now you can achieve automated semantic release nirvana in less than five minutes. This guide assumes that your GitLab instance runs at https://gitlab.team.com and your private NPM registry is available at https://registry.team.com/. Create a new project "foo" on GitLab, in my case it will be hosted at our private https://gitlab.team.com/gleb/foo server. Create local repo with simple test project. We will need to tell semantic release tool where the remote GitLab server lives. Edit the created package.json file and add the repo HTTPS url (and not SSH git url. This will be fixed soon). We also should add the publishing config to point at our private NPM registry, while we are here. I also recommend changing the version to reflect the fact that we will no longer publish it manually. Create GitLab CI file with two stages. First stage will just run unit tests. If it passes, then we are going to publish a new package version (if there are semantic changes) to NPM. Here is an example .gitlab.ci file with cached modules for speed. The actual commit log parsing, version increment, publishing new version and tagging the release is done by the module semantic-release-gitlab. Unable to determine next version to release. Likely because there are no changes to release. Notice that we are ignoring the result of the semantic-release-gitlab call. This is to ignore non-zero exit code when there is nothing to be published. git commit -m "fix(log): fixed logging call"
Similarly, a commit that adds a new feature should start with feat(what): .... Any commit that breaks existing API should have BREAKING CHANGE text somewhere inside the commit message text. Let us add a couple of fake commits to force the publish. git commit --allow-empty -m "chore(ci): setup CI"
git commit --allow-empty -m "feat(release): semantic release FTW"
Because we are following Angular commit convention the chore(ci): ... commit message should trigger patch release. But the next commit is a feature commit feat(release): ... it will trigger minor version upgrade. The larger upgrade wins. If you do not want to release a new version, just commit with regular text that does not start with fix, feat, etc. The CI job needs to authenticate with both NPM registry to publish, and with GitLab itself to push new tag. Grab the NPM_TOKEN from your private registry and set it as variable in the GitLab CI https://gitlab.team.com/gleb/foo/variables Set it as the CI variable NPM_TOKEN. While we are setting CI variables, go to GitLab and make yourself a new access token at https://gitlab.team.com/profile/personal_access_tokens. I prefer naming them <project_name> semantic release. Set it as the CI variable GITLAB_AUTH_TOKEN. Go back to the CI pipeline and restart the "Deploy" build. You should see the package publish and release log messages. We just got ourselves package @team/[email protected]! 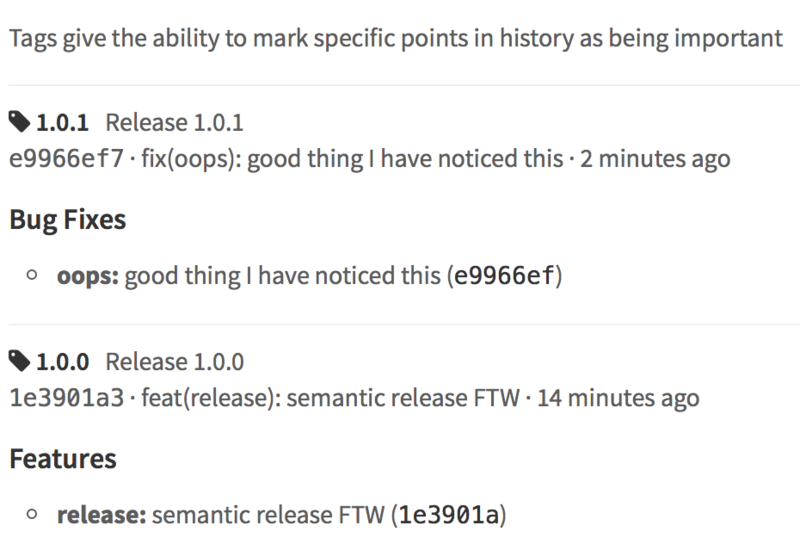 Let us add a few commits, for example a fix commit and watch publishing and tagging happen automatically after pushing the code change to the remote. git commit --allow-empty -m "fix(oops): good thing I have noticed this"
Take a look at the project tags page https://gitlab.team.com/gleb/foo/tags. It shows nicely formatted change log - you no longer have to generate it manually.